The most important thing I've learned about humans came from a horse (that's us in the photo--Kathy and Kara--taken yesterday), but it's backed up by brain research on humans. You can't be afraid and rational at the same time. Pick one. You're about to step into the street when out of the corner of your eye a car appears. There is a gap between when your brain perceives the car and when you are consciously aware of the car and can think about it. That gap could mean the difference between you being flattened by the car and... not. There are simply too many situations where you just don't have time to wait for your cortex to kick in, so your brain has another mechanism for acting without the overhead of involving your cortex first. And even if your cortex did get the news, taking the time to think could get you killed... by the time you come up with a plan, it's too late to execute. And thousands of years ago, the humans who did NOT stop to think were the ones who stayed alive long enough to... breed. Their "wait, I have to weigh the tradeoffs here" counterparts were clubbed to death, eaten by tigers, and flattened by falling boulders. Darwin won, and here we are stuck with legacy brains. Fortunately, you DO have a cortex that gets the message, eventually. And it's the thinking cortex that stops you from, say, perceiving a horror movie as an actual threat to your life. But if you're continuously in a state of fear over something, your cortex is not going to be running the show; the emotional subsystems stay in charge, and you're more likely to use instinct than logic. With my horse, if I want her to continue to think, I have to work at keeping her from being afraid. And when she is afraid, the best way to calm her down is to give her something to think about, like a puzzle to solve. Something challenging but not inherently scary like maybe a "figure out which trick will earn you a carrot" game, or having her walk backward through a gate instead of forward. And that means I have to teach her how to solve these puzzles during those times when she is not afraid, so that I have something to use when she is. It works on people, too, but there's something else to consider... the dark side of the equation. Imagine that you did want someone to be afraid, because you specifically do not want them thinking rationally and logically. What if your goal is to convince them to do something that's not in their best interest? One approach is to make sure that they stay as fearful and anxious as possible, to make it more difficult for them to focus and think rationally. It's a trick that's been used by governments, managers, manipulate family members, and advertisers for ages. We all need to recognize when someone's doing that to us. And I would start with the television "if it bleeds it leads" news. Unlike television shows, movies, and video games--which your brain knows aren't real--a brain perceives the news as "real" and often concludes that things are far more dangerous than they really are, thanks to the dramatic statistic imbalance (reality distortion field) between what is displayed on the news and what is actually happening outside your front door. It's not like you'll ever hear, for example, a nightly new run down of all the people in your city who were NOT in fact killed in a drive-by shooting that day. The "good news" is usually a 20-second spot at the end about a rescued kitten. And of course if you want the best from your employees, never manage through fear. And if someone's trying to manipulate you through fear, the best thing you can do is get away from the input. One idea is to use Tivo to skip the news promos, and get your news instead from the internet or radio -- according to Restak, the brain has a much saner reaction to bad news when it's not accompanied by high-resolution moving visuals. But if you can't get away, have some left-brain activities and tricks handy to try to kick-start your cortex and shift the balance of power away from the lower-level emotional subsystems in your brain. Apparently it really does help to take a deep breath and tell yourself, "OK, it's just my amygdala talking here..."
Good post, this one will definitely stay with me for a while. It's one of those things that you always know to be true but you never stop to properly examine/define it. Hap is my (now) 20 yo Thoroughbred, bought when he was eight. When he was 14, I started clicker training him, because he had become so spooky that I knew the odds were he would probably seriously hurt me someday when I failed to stick through one of his more spectacular efforts and landed badly. Although longing helped, he was diagnosed with navicular syndrome about that time, which means I didn't want to stress his feet any more than I had to. With clicker training, I taught him to focus on the inside of the arena, instead of the bugaboos on the outside. But I think, more importantly, it creates a psychological safe space for him. If I can get him into that safe space, and keep him there, he will do anything for me. And it also creates a safe space for me: knowing that Hap will stop if he hears a click is very reassuring for me if things start to become exciting. At 20, Hap is sound mentally and physically, and, I think, happy. I haven't longed him in years, except to check him for lameness problems. I use the clicker with all the horses I interact with, and my dog as well, and don't even think of it as a technique any more, it is just the way I train. Once I get the critter conditioned to the little mechanical clicking device, I switch them to a tongue click. The only downside is when I have several of my critters together, and I click one. All the eyes light up and everyone wants to play. This is why one of the first things I train is backing away from me, so I can get a little personal space. I wonder how this relates to going into shock - where you've had a traumatic incident but don't feel anything for a few days - you just deal with ever is going on like its nothing. Sir, I am learning java. I refer Head First series books specially . I want 2 know the meaning of Diagram in detail given on page no. 731 of HEAD FIRST SERVLET & JSP.The name of the topic is Enterprise Design Patterns:Patterns & Struts. The line is as follows: A single MVC app. will have many Model's,View's,Controller's.Please Reply!!!!!!!!! http://www.javaranch.com in the Moose Saloon forums. If you go to the SCWCD forum, you can both search for and ask questions about anything from the book, and you'll find a LOT of people there currently studying from the book who are discussing the very same issues you're talking about (javaranch has more than a half-million unique visitors a month, so the forums are *extremely* active). While we do post general book information/updates on this blog, we try to keep technical Java discussions on javaranch and not here, since this blog is not specific to Java or even programming, and most of the books we have in progress now are not about Java. But again, to help keep the blog discussions here consistent with the topics, I'd like to move the technical book questions to javaranch--where you'll get much better help than I can provide here--or if it's an errata issue, the O'Reilly site is the other place to look for answers. Thanks! I wanted to respond to Gain's request for "not forgetting" refrences. I've heard a lot of discussions and studies linking sleep to long term memory. I like to think of sleeping as a way to convert short term into long term, or in techie speak: defragment. I wanted to respond to Gain quest for "not forgetting". I've heard a lot of discussions and studies linking sleep to long term memory. I like to think of sleeping as a way to convert short term into long term, or in techie speak: defragment. I think we have the same reading list! I read something very similar recently in "Overachievement" by Dr.John Eliot. In that book, Dr. Eliot lays out two frames of mind ... one for preparing and one for performing. Preparing involves cognitive thinking about what you are doing while you should not "think" while you are performing. Of course I'm drastically oversimplifying it, but I think you get the picture. If you are interested in perceptions below the cognitive level, you might also like "The Gift of Fear" by Gavin deBecker. It focuses on how fear can help you (as an early warning system before you consciously notice a threat) and since Gavin's company provides protection for celebrities (from stalkers and the like) he has some unusual stories in the book as well. I look forward to hearing about the next book on your reading list! (I already added Poe's Heart to my Amazon Wishlist). As for television news: in a world with something like six billion people, if at least a few horrible and atrocious things don't happen on any particular day, *that* would be a cause for concern. The evening news could probably be more accurately titled "Who Drew The Shortest Straws Today". Great pic Kathy. 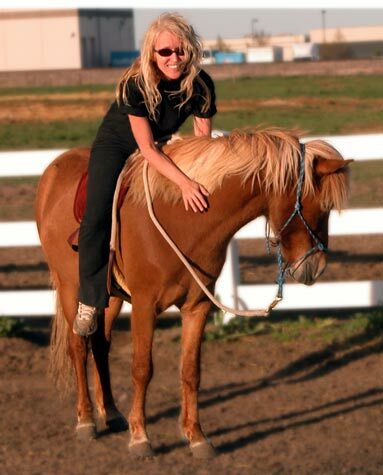 Nothin hotter than a smart, smiling blogging babe on horseback! p.s. The post is brilliant as well. You NEVER disappoint. Johnny: better still, how did she match her own hair to the horse's mane? "...how did she match her own hair to the horse's mane?" Ah, well, you know... Java programmers are known for their superb ability to accessorize. But it's no big secret, really--we both go to the same stylist. I just found this site today and am once again amazed. I have been amazed by Javaranch and the Head First series of books. I find the breadth of your ideas fascinating. I am a Java developer and I have spent a lot of time, like most people, thinking about what is important (whether it be a Java program, Website or life in general). I recently read a book, Destructive Emotions by Daniel Goleman that discusses many of the things that you talk about in your entry today. Have you read it? I am looking forward to reading more from you. By the way, I like the horse. My first thought when I saw the title was about procrastination. Probably because it's what I've been doing all day, but it's been on my mind. I've been thinking about this, (instead of working), and it seems that procrastination for me almost always starts out from some kind of low-level anxiety. Then, of course, the procrastination produces more anxiety. What this article made me realize is that the anxiety itself was inhibiting my ability to think, and since thinking is the main way out of procrastination, it's a vicious circle. You can't reason your way out of anxiety. If something does get me thinking, like a sudden insight or something, then the anxiety disappears, and I can get right into that zone where I forget to get up to go to the bathroom or to eat. I've never made the connection between the two before. Thanks. i am afraid of my horse my husband trains them but i am afraid they will kick me or kill me. when i get nera him i think he will hurt me he is 2 years old and my husband is training him. but he is very calm never kick anyone before. how can i overcome this so i can train my horse.